With the right funny birthday toasts, you can make your audience and the birthday boy or girl laugh with you, not at you! The right funny toasts have a certain quality that others don't have: their comedic punch makes the whole experience of growing older just a little bit easier — on what's probably the best or worst day of the year for the birthday girl or boy. 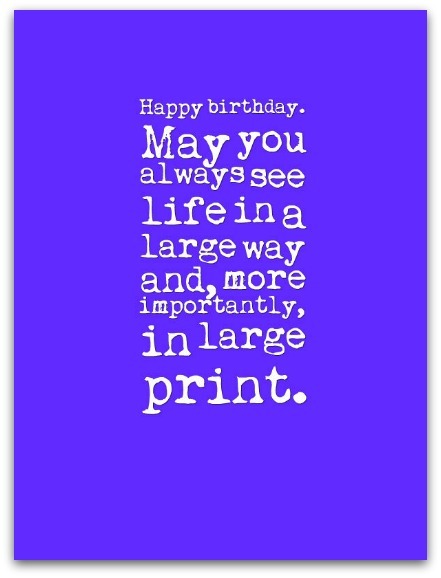 Here, you’ll find only the right birthday messages for toasting. 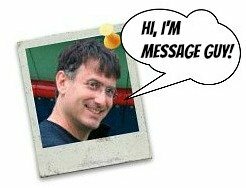 Today, I would like to toast our birthday boy and, in the process, defend his dignity. My friend, if anybody ever calls you an old man, you should look them in the eyes with your bifocals, hit them over the head with your cane and throw your dentures at them! Happy birthday, you old fart! Happy birthday. May you always see life in a large way and, more importantly, in large print. Happy birthday! When I look at all birthday candles on your cake, I have two thoughts: one, you've been fortunate to have such a long, illustrious life and, two, I hope your fire insurance premiums are up to date. Here's to you reaching an age when the compliments you receive about your looks are regularly accompanied by the refrain "for someone your age." Happy birthday. As you travel through life, may your troubles be as few and as far apart as my Grandma's teeth. Here's to getting older, getting wrinkles, getting age spots, getting jowls, getting anything but the acne we had as teenagers! Happy birthday! The good die young, so here's hoping that you may live to a ripe old age, being a bad, bad man. Happy birthday! May you be happy on your birthday and every day of your life...and may your enemies know it. As Mark Twain once said, “When you ascend the hill of prosperity, may you not meet a friend.” Happy birthday and happy trails, my friend! I've heard it said many times that wisdom comes with age. I must say I'm not convinced…I know lots of stupid middle-aged and old people. As of today, you don't fall into this group but I'm watching you. Happy birthday. 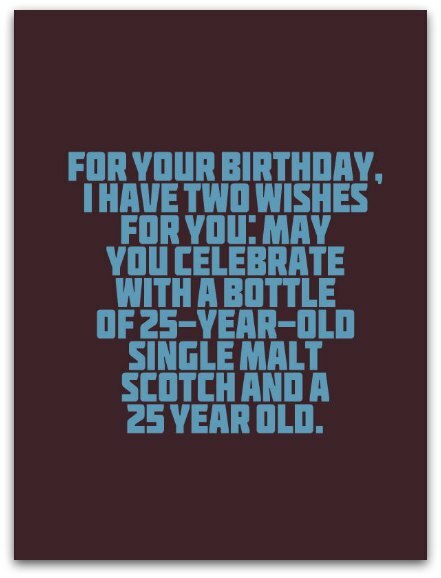 For your birthday, I have two wishes for you: may you celebrate with a bottle of 25-year-old single malt scotch and a 25 year old. I've always been told that time heals all wounds, but nobody ever warned me that it also brings wrinkles the size of the Grand Canyon and skin as saggy as a Basset Hound. Still, it's better than the alternative...you know, acne! Happy birthday! As a good friend, it's my duty to tell you that, at your age, blowing out your candles may not be a great idea — your dentures may fly out and seriously injure someone. Just a thought. Anyway, happy birthday. To a true gentleman who has never forgotten his roots, his alma mater or the city that brought him success. Of course, at his age, it's probably because he's forgotten just about everything else. Happy birthday! Cheers! Nothing but the best for our birthday girl. That's why she has us as friends. Happy birthday!